Stephanie and I rode along with 1700 riders the 60km Ride yesterday from Alexandra Gardens starting at 7.30am to Mordiallac and back. Due to the predicted high winds the Bicycle Network in their wisdom changed the route at lunch time on Saturday.The original Route was to Altona and back. It was the correct decision. The new route avoided the dangerous high winds on the Westgate Bridge for the safety of ALL riders doing the 50km. We thanked the Bicycle Network for their foresight in altering the course at such short notice for the well being of those riding, as we all experienced some strong winds during the day. It was marvelous to see so many young children aged 9-11 years digging deep and riding their little hearts out and not letting the “winds beat them”on the return journey into the NNW’s from the turnaround point at Mordiallic. At this time in the day the ferocious winds didn’t pick up until later, thankfully. It was great to see so many cyclists of all ages and from so many nationalities supporting Bicycle Network. Over 10,000 cyclists entered this years ride. Stephanie and I would like to see more members from Cycling Geelong supporting the ride. Every year we look forward to entering the ride and supporting Bicycle Network whenever we can. 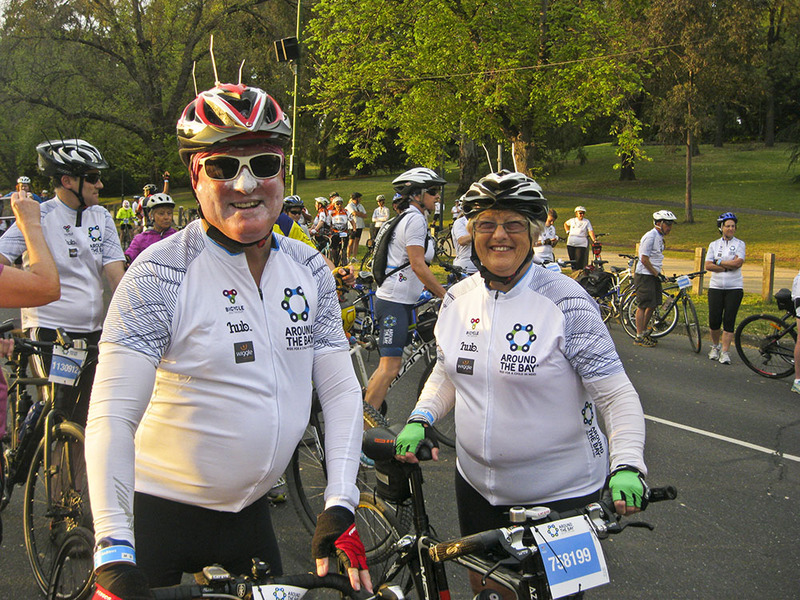 Stephanie and Geoff at the start of the 2015 50km of Around the Bay – better weather then, but just as much fun this year. We are appreciative and grateful for the 20+ Members who Volunteer their time for the whole day to benefit the Club.